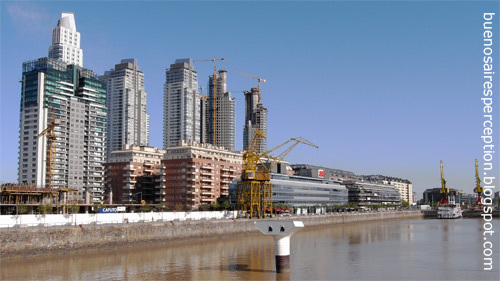 The Puerto Madero district is the most modern neighborhood in Argentina's capital. After it has been completely remodeled it is now offering deluxe hotels, luxury apartment and exclusive residential housings as well as high-priced restaurants and bars. This reminds me a bit of a cartoon I once saw showing the Embarcadero towers 1, 2, 3, and 4 all lined up and with even more following them so that they spread all across the country. I like the line of skyscrapers, but it indicates rapid change in uncertain economic times and may mean empty offices for awhile after they are finished, do you think so?